We can supply UV Transparent Resin -Invisible Printing turns to Blue color under UV Light. Used for Security printing. Being a client-centric firm we are into manufacturing, exporting and supplying Thermal Transfer Ribbons. 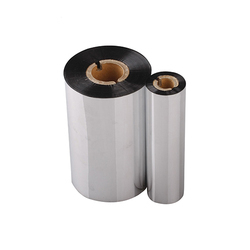 Our organization deal in best quality of Thermal Transfer Ribbons and we offer them to our clients. Our Thermal Transfer Ribbons are like TTR Wax, TTR Wax Resin, Resin and Silicon Rubber Roller with various sizes and hardness (shore A). Our company has achieved milestone for providing Thermal Ribbon to clients. This product survives outside in full sunlight and can stand immersion in water. Offered range is manufactured using high grade basic material under the guidance of our skilled professionals as per the latest market developments. We have marked a distinct and dynamic position in the market by providing a quality assured array of Thermal Transfer Ribbons. In order to suit the precise requirements of our esteemed clients, our enterprise is dedicatedly engaged in providing Color Thermal Transfer Ribbons in the market. Ribbons Wax, Wax Resin, Wax Resin Premium, resin, Wash Care etc. Colored Red and Green etc. Brand : Fuji Copian and Ricoh etc. - Wax Ribbons : Available for general-purpose printing application. - Wax / Resin : Available for high speed printers and exceptional level of smudge and scratch resistance. Being a highly effective and fast-moving company, we are highly involved in providing an extensive collection of Thermal Ribbons. Offered product is made up and designed by adept personnel by making use of optimum-quality material and hi-tech technology. More to this, patrons can buy this product from us at affordable rate.